Does GNC even sell supplements to geeks?? 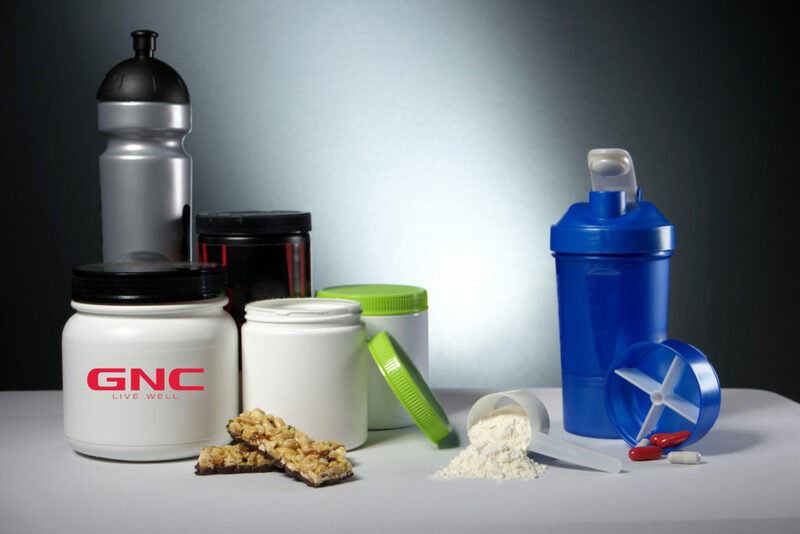 GNC, known by no one as General Nutrition Centers, is the go-to supplement shop for all (or at least most) of your meathead, bodybuilding needs — so long as they’re not natural and non-steroidal. From proteins to pre-workouts, creatine to those kind of tasty-ish vitamin chews, GNC has everything your muscles need to get big and built and yoked. But what about your brain? What about the meat inside of your head? What does GNC offer for the incredibly intelligent geek types, such as, well… me? For the GNC Gold Card Members, this is good news: you have potential discount rewards available for your next big nootropic stack splurge. But even so, you don’t want to waste those precious dollas on any ol’ GNC brain health stack. You want the best. And that’s what this guide is all about: revealing the best of GNC’s best nootropic supplements. So, let’s get to it, baby. Believe it or not, GNC’s roots dig deep into the way olden days of 1935, starting as a small health food store by the name of Lackzoom. That’s right: Lackzoom. Why anyone in their right mind would change their store’s name from Lackzoom to GNC is an absolute mystery to me, but there it is: Lackzoom. I’d buy my supplements from Lackzoom. But I don’t. Instead, I (occasionally) buy them from GNC, General Nutrition Centers, the name given to the store during the 1960s’ health food craze. 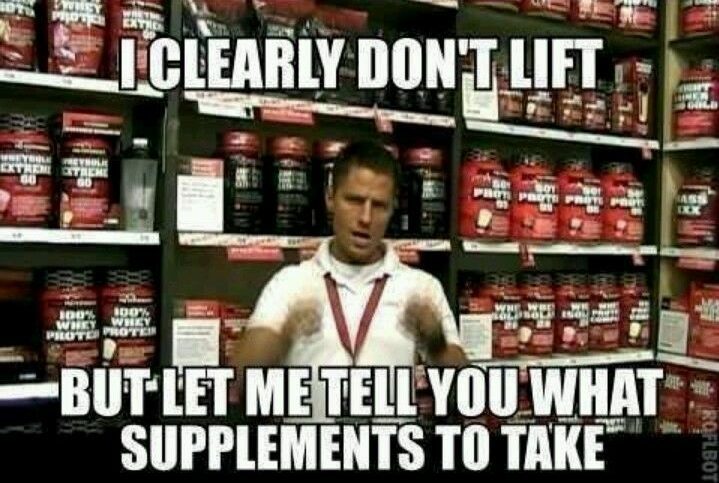 Today, the store is best known for its bodybuilding supplements, weight loss pills, protein powders, nutritional multivitamins, health and beauty products, and faux-hawked employees, who are either over-eager to share their keto-diet routine with you or over-douchebaggish, trying to flex on you and your supplement buying decisions. Because GNC is primarily an exercise health store, I tend to only enter a GNC store with the intention of buying sports nutrition supplements — at most maybe protein and some pre-workout stacks. However, occasionally I’ll check out what GNC has to offer in terms of brain health, and, well… to be honest, it’s usually not much. And I can sympathize with GNC a bit here — after all, GNC sells only natural supplements. Which means you won’t see the likes of racetams or any other synthetic-type cognitive enhancers. In fact, GNC found itself on the wrong end of a $5 million lawsuit for selling “unapproved” supplements — specifically the nootropic: picamilon. (If you aren’t familiar with picamilon, it’s a synthetic compound of two bound natural ingredients: GABA and niacin. In other words, the ingredient has all natural parts, it’s only their bond that’s synthetic.) As a result, I imagine GNC is pretty picky with the nootropics it allows in its store. So, then what are your options for nootropics, if you’re both a GNC buyer and a nootropic enthusiast? Surely they have something worth buying, even if it is strictly clean and natural? Just ask Billy. Billy knows. myGNC Rewards – Free membership that gets you $5 cash back for every 150 points (1 point per dollar spent, as well as a “Free Birthday Gift” (whatever that may be). myGNC Pro Access – $39.99/year membership that gets you the myGNC Rewards benefits, in addition to Pick-Your-Day Sales, Free Expedited Shipping, Pro Boxes, and Pro Access Giveaways. Which is all pretty neat stuff, I suppose. If you’re not into the whole rewards thing, you can save money by bulk ordering your supplements for that free shipping (on orders of $49+) or sign up for the “AUTODELIVER & SAVE” option to save 10% on your orders. This isn’t a bad idea, if you’re planning on taking a supplement long-term. And if you have that free myGNC Rewards membership, then those occasional $5 cash back rewards may get you a nice little pack of vitamin chews, or something, every so often. And that’s it for my thrifty geek shopping advice. The question of the Best Nootropic Supplements at GNC comes after the first question: does GNC even sell nootropic supplements? Again, we got this out of the way in the intro. 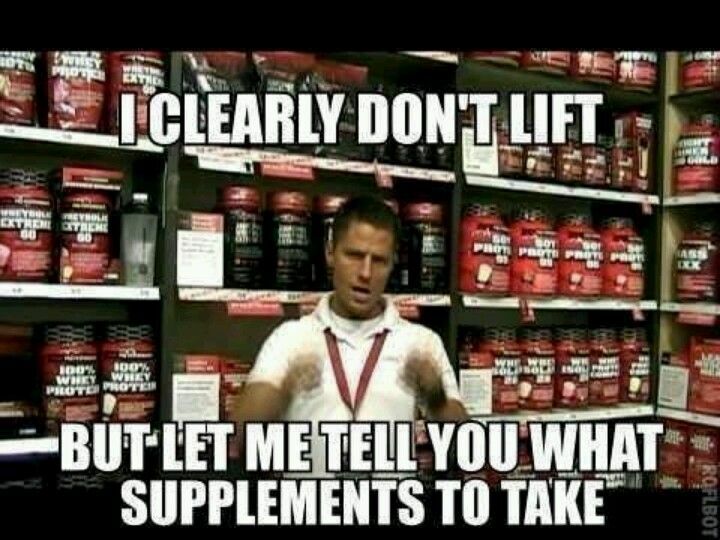 The answer is: Yes, although GNC doesn’t sell many, and most of them aren’t even that great. 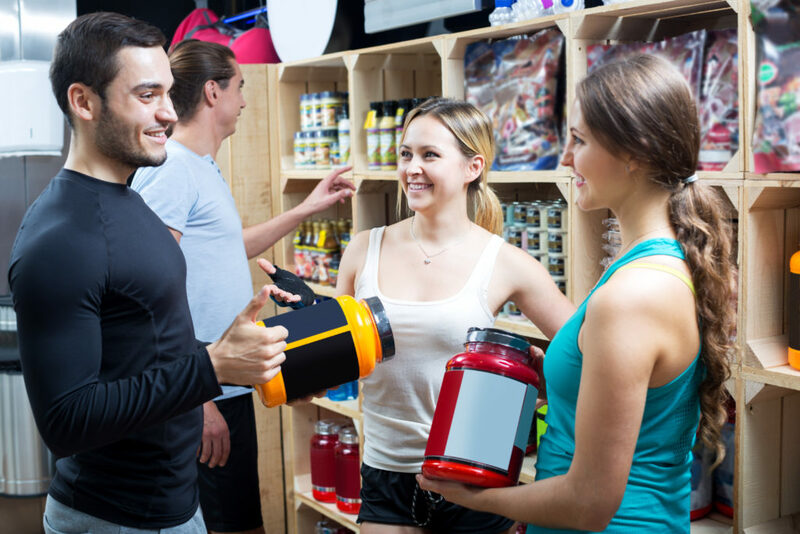 However… there are a few gems stashed away on those GNC shelves (and in the online store) that are worth considering, especially if you’re a frequent GNC shopper. Beyond Raw is a courteous communicator, telling us exactly what it’s selling with its product title: Nootropic — plain and simple. Beyond Raw Chemistry Labs Nootropic is a nootropic supplement manufactured by Beyond Raw as part of their Chemistry Labs series. Oh, yes — does it work?? Of course, which is why I’ve included it on this Best Nootropics at GNC list: Beyond Raw Chemistry Labs Nootropic is a powerful mental performance powder with one of the largest Tyrosine dosages on the 2018 market, as well as a few brain boosting herbal adaptogens and antioxidants. It’s a “game day” nootropic stack with both short- and long-term cognitive advantages. The short-term advantages: quick, acute boosts on focus, mood, and energy. And the long-term advantages: brain-building neuroprotection and neuroregeneration. 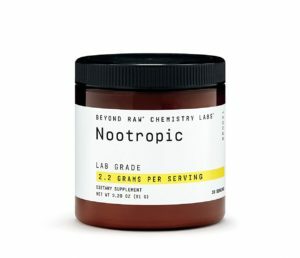 The mix of anti-stress nootropics (Rhodiola, Tyrosine) with anti-anxiety L-theanine makes Beyond Raw Chemistry Labs Nootropic a brain healthy “feel-good” treat — even if the powder sort of tastes like garbage. 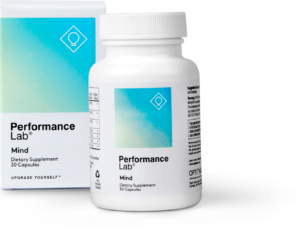 It’s an awesome mental performance stack that doubles as a physical performance booster as well, appealing to both the nootropic nerds and GNC meatheads. Most nootropic supplements go the capsule or tablet route with their servings. Beyond Raw Chemistry Labs Nootropic goes with the scoops instead, allowing for heftier ingredient dosages and (potentially) faster ingredient absorption. Having said that, this means you have to taste Beyond Raw’s nootropics… and in their powdery state, most nootropics taste God awful. But whateva. Your healthier, enhanced brain can deal with it. With exception to GABA, which is a orally weak nootropic, Beyond Raw Chemistry Labs Nootropic supplies generally high quality nootropic ingredient brands, including: Synapsa™ (Bacopa Monnieri), TeaCrine® (Theacrine), Suntheanine® (L-Theanine), and NeuroFactor™ (Coffee Bean Extract). That’s a lot of brands, my friend. 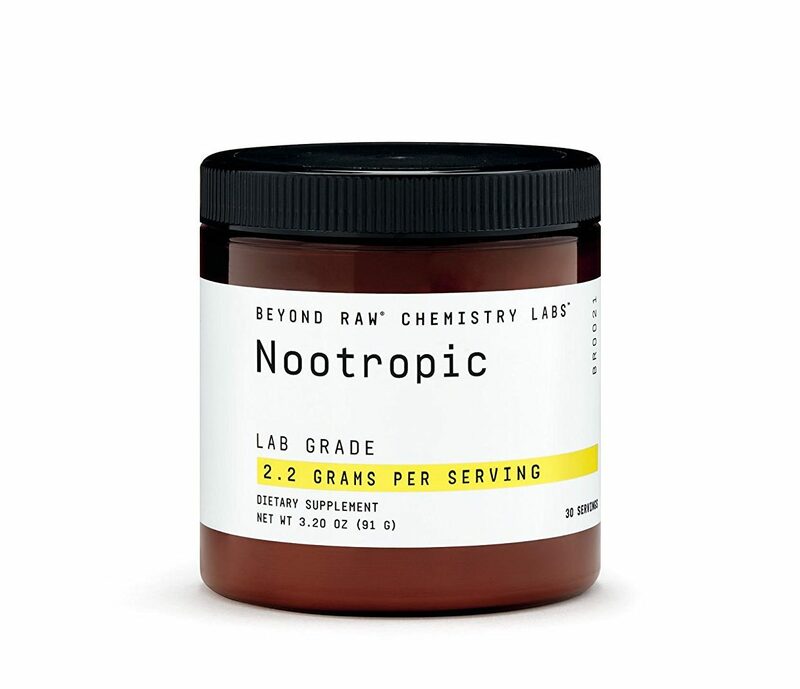 With these adaptogens and herbal extracts, Beyond Raw Chemistry Labs Nootropic delivers powerful anti-stress feel-goods that can be felt across the brain and body. It’s great for the geeks, but it’s also great for the active, athletic jocks. It’s not a bad stack to mix with your pre-workout (especially if it helps drown out this powder’s bitter, bitter, bitter taste). Read my in-depth Beyond Raw Chemistry Labs Nootropic review. Here’s what I like about Performix TCP: it has balls. And I’m not trying to be immature or gratuitously grotesque. (Okay, I am a little bit.) But I mean it literally: Performix TCP (Timed Cognitive Priming) has little floaty balls in its liquid capsules, a staple of Performix products that presumably enhance the formula’s ingredient absorption rates — or something. Brain Energizer Matrix – MCT for oily brain nourishment and caffeine + L-theanine for calm mental stimulation. Brain Focus Matrix – Focus delivered by a smart mix of cholinergic herbs and compounds, plus a groovy addition of adaptogenic Ashwagandha. It’s a smart mix, hitting both quick mental stimulation and long-term nootropic brainpower boosts. 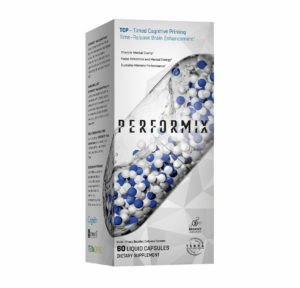 By not only ramping up the brain’s dopamine activity for increased mood and motivation but also sharpening the cholinergic pathways to better focus and memory, Performix TCP supplies a legitimate nootropic energizer — rather than your usual, cheap-O caffeine pills. It’s an actual smart smart pill formula, and one of the best GNC has to offer. Time-Release TERRA Bead Technology. You’ll find this labelled on all of Performix’s products. Granted, this isn’t the only supplement brand to do the whole beads-in-capsule design. But it is a unique format all the same, potentially increasing the amount of nootropics that enter your body over time, considering that they’re not all competing for absorption at once. The three stand-out nootropic brands in this supplement: Cognizin® (Citicoline), Sensoril® (Ashwagandha), and TeaCrine® (Theacrine). However, the remaining ingredients are also impressive, as Performix TCP supplies potent, standardized herbal extracts over the cheap, ineffective plain powder stuff. Caffeine isn’t the best nootropic, even if it’s the world’s favorite stimulant drug. But when you stack it with L-theanine, which offsets caffeine’s jitters while sustaining the focus benefits, and theacrine, which lengthens caffeine’s effects over time, then you’re getting the true nootropic caffeine experience. One that actually sharpens mental performance rather than jolting your brain to crashing exhaustion. Read my in-depth Performix TCP review. I’ll just say it: Jarrow Formulas Neuro Optimizer looks weak. It looks like a weak, cheap formula designed to trick elderly Wal-Mart customers into buying a few bottles per month. From the label’s title font to the deep, clinical blue, this stack looks booooooring. 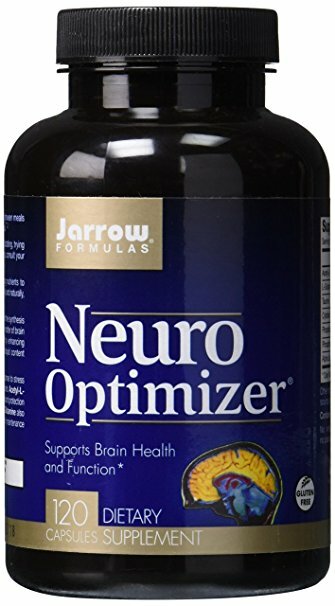 Jarrow Formulas Neuro Optimizer is the real deal, supplying a few solid brain building nootropics: citicoline, phosphatidylcholine, and phosphatidylserine — with a couple brain restoring compounds, such as ALCAR and Alpha Lipoic Acid. These are ingredients that not only enhance neuronal plasticity but improve their cellular membrane structures. Neuro Optimizer isn’t an off-base title for this supplement. Granted, younger nootropic users may not get the most out of this brain booster. While ingredients such as ALCAR and phosphatidylserine may deliver certain conditional cognitive benefits to everyone, it is the older folk who seem to benefit most by these nootropics. So perhaps that explains Neuro Optimizer’s serious, blue design: it is designed for the old folk. But fortunately it’s not designed to trick anyone. Jarrow Formulas Neuro Optimizer is one of the healthier brain stack options at GNC, particularly for cognitive longevity. No cheap caffeine or stimulants or synthetics. Only safe, brain healthy nootropics and nutrition here. By supplying neuronal and neurotransmitter building block materials, as well as a substantial dose of antioxidant neuroprotection, Neuro Optimizer reads as a genuinely healthy health supplement. And the non-proprietary status of the label only increases my confidence in this product. The two most impressive ingredients in this short, simple stack: Cognizin® (Citicoline) and Sharp-PS® (Phosphatidylserine). The remaining ingredients are fine in their formats. Although ALCAR is the standard carnitine form used in brain health stacks, it’s worth pointing out that had Neuro Optimizer went with standard L-carnitine, the amino wouldn’t be able to pass the blood-brain barrier to achieve any nootropic effect. So, that’s pretty cool, too. Jarrow Formulas Neuro Optimizer has two awards under its belt: Better Nutrition Magazine‘s “Best of Supplements” (2011) and Vitamin Retailer Magazine‘s “Vity Award” (2010) — for whatever that’s worth to you. (I doubt any of you care what those magazines think.) But it’s worth pointing out to highlight Jarrow Formulas’ solid reputation as a supplement manufacturer. Read my in-depth Neuro Optimizer review. BrainJuice is juice. Actual factual juice with so much juicy goodness — we’re talking açaí berry juice, blueberry juice, and (you’re damn right) acerola cherry, a natural, rich source of that sweet, tart, antioxidant vitamin C.
And you know what BrainJuice doesn’t have? Sugar. Okay, it has 1 g of sugar, but it doesn’t have any added sugar. And that’s a big deal for a nootropic juice supplement claiming to work as an energy drink alternative. After all, what we’re essentially looking for when we’re looking for an energy drink alternative is a drink that’s not only low on unhealthy sugars and additives and all that other crap but also a drink that’s rich in, well… healthy stuff. The healthy stuff in BrainJuice doesn’t only include that berry and cherry powders but clean, green nootropics: alpha-GPC, green tea extract (caffeine), ALCAR, NALT, and L-theanine — or decaffeinated green tea extract, if you buy the caffeine-free bottle version. While it’s not the best nootropic format for ongoing daily brain health boosts, due mainly to the drink’s price, it’s good for quick boosts on mental performance and energy. Somewhat of an “as-needed” supplement, even though citicoline works very awesomely when taken over time. In terms of ingredient quality, BrainJuice’s nootropics are pretty standard. We’re seeing about average alpha-GPC with average L-theanine and juicy berry extracts. The only thing that really stands out is the N-Acetyl-L-Tyrosine, as opposed to the standard L-tyrosine. But that’s about it. Which is fine: BrainJuice’s ingredients are effective enough as is. Any supplement that successfully pulls off the “energy drink alternative” design outright earns extra geek points in my book. I’m not one to harp on the negative health effects associated with habitual energy drink consumption… however, those dranks are nastayyyy on the brain and body. Thus, whenever a supplement comes along that supplies something that’s not only tasty but healthy and stimulates the mind… hell yes, I’m on board. Bring it on, BrainJuice. Read my in-depth BrainJuice review. However, the current Procera AVH, which still kept the AVH acronym, tossed out its V (vinpocetine) for a G: Ginkgo biloba— which accomplishes more or less the same cerebral circulation benefits as vinpocetine, in addition to the herbal extract’s boost on working memory. The V-to-G swapperoo doesn’t break the formula’s sharp, simple synergy, so I’m cool with it. If anything, the move to ginkgo only enhances the stack’s nootropic status, as Ginkgo potentially has a greater range of bio-benefits than vinpocetine — even if it does have a heavier dosage requirement. 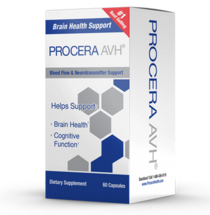 Similar to Neuro Optimizer, Procera AVH is best for older folk cognition. Younger, healthy users may get somewhat of a mental kick out of this three-ingredient stack — especially from ginkgo’s acute brain boosts — but it isn’t until age-related cognitive decline becomes a thing that this supplement really starts kicking. Even so, the AVH combo is never a bad idea to add to your nootropic stack. There’s really not much that’s unique about this formula, considering that many, many brain health stacks carry these three ingredients — however, the fact that Procera AVH carries only these ingredients makes it a solid stack option. Meaning you can stack this stack with other supplement stacks, sort of as an AVH cogwheel that’s perhaps missing in your current brain health enhancement setup. There’s only so much you can do with three ingredients, yet Procera AVH does a fine enough job with its Ginkgo Biloba extract: 24% flavone glycosides, 6% terpene lactones. The other two ingredients — ALCAR and Huperzine-A — are fairly standard quality, but effective. Of all the “best” nootropic supplements on this list, Procera AVH is perhaps the least impressive. Yet, I give the manufacturers props for updating their formula as they see fit, swapping out the vinpocetine for an enhanced ginkgo biloba extract. This indicates to me that the Procera crew is willing to continually improve their stack, if newer and better ingredients emerge that can do the job better. Read my in-depth Procera AVH review. On the Mind Lab Pro F.A.Q. page, Opti-Nutra states why they decided not to sell Mind Lab Pro on Amazon, GNC, etc. And I actually tend to agree with their decision: poorly written customer reviews (these can actually be pretty fun to read tbh), mob review bombs, association with poorly regulated supplements, etc. 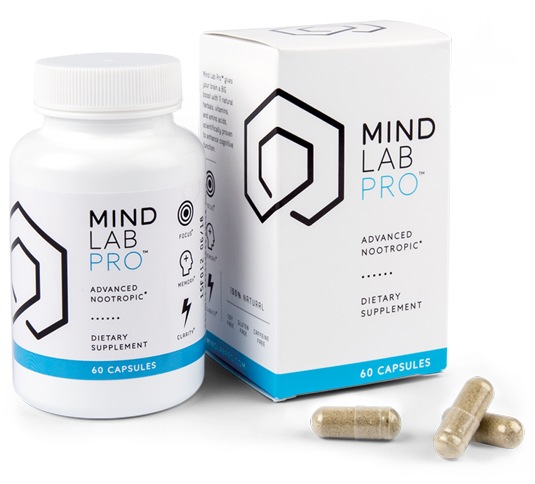 And what’s particularly neat-O about Mind Lab Pro is how its 11-ingredient formula design hits a synergy-within-synergy approach to brainpower, covering all of the key brain bio-pathways — Energy, Brain Chemicals, Blood Flow, Brainwaves, Neuroprotection, and Neuroregeneration — required for a fully optimized brain. If you’re not impressed by GNC’s selection, I definitely recommend checking out Mind Lab Pro at mindlabpro.com. If you’re looking for a one-and-done nootropic stack, Mind Lab Pro’s Universal Nootropic design has you covered. However, if you’re already supplementing several of its ingredients elsewhere, yet you still want the powerhouse cognitive enhancers found in Mind Lab Pro’s formula, then Performance Lab Mind seems your best bet. 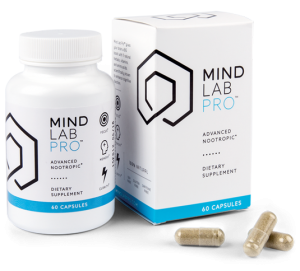 This supplement shares four of Mind Lab Pro’s 11 ingredients, including: Citicoline (as Cognizin®), Phosphatidylserine (as Sharp-PS®), N-Acetyl L-Tyrosine, and Maritime Pine Bark Extract. 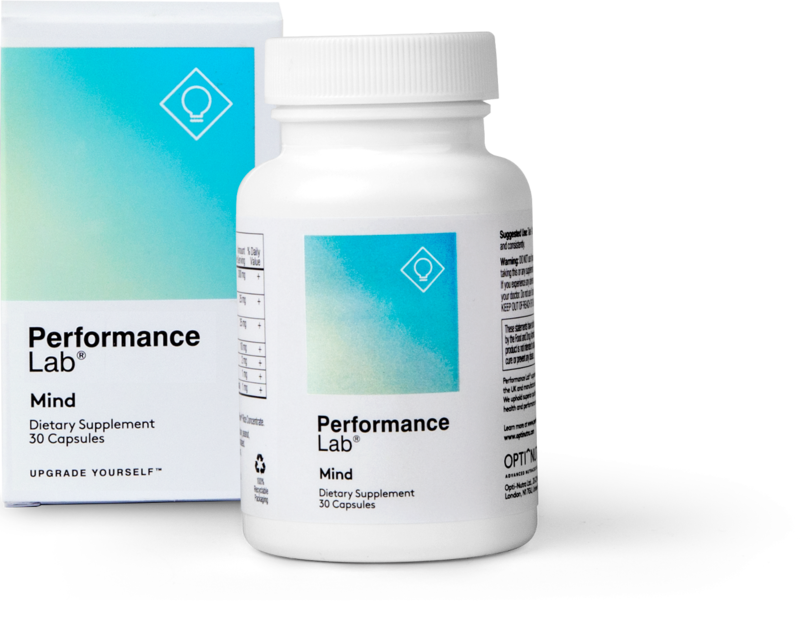 It’s a smart addition to the Performance Lab supplement series (found at performancelab.com), which showcases an impressive series of pick-and-choose supplement options. High quality, high quantity, high variety. Those are the “highs” that I’d attribute to Awaken Gold, which advertises itself as a sort of high-tened consciousness supplement more so than your run-of-the-mill nootropic brain health supplement. It’s all in the name: Awakened Alchemy seeks to awaken your mind to an elevated state, fulfilling a Silicon Valleyish sort of transhumanist pathway to bio-hacked enlightenment. 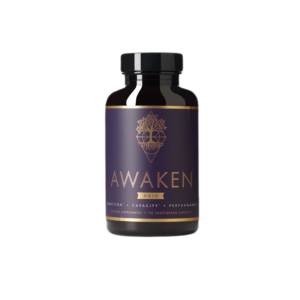 In terms of formula design, this sense of bio-hacked enlightenment manifests in Awaken Gold’s unique mix of natural nootropics — Ashwagandha, Phosphatidylserine, L-Theanine, etc. — and a synthetic smart drug: Noopept. 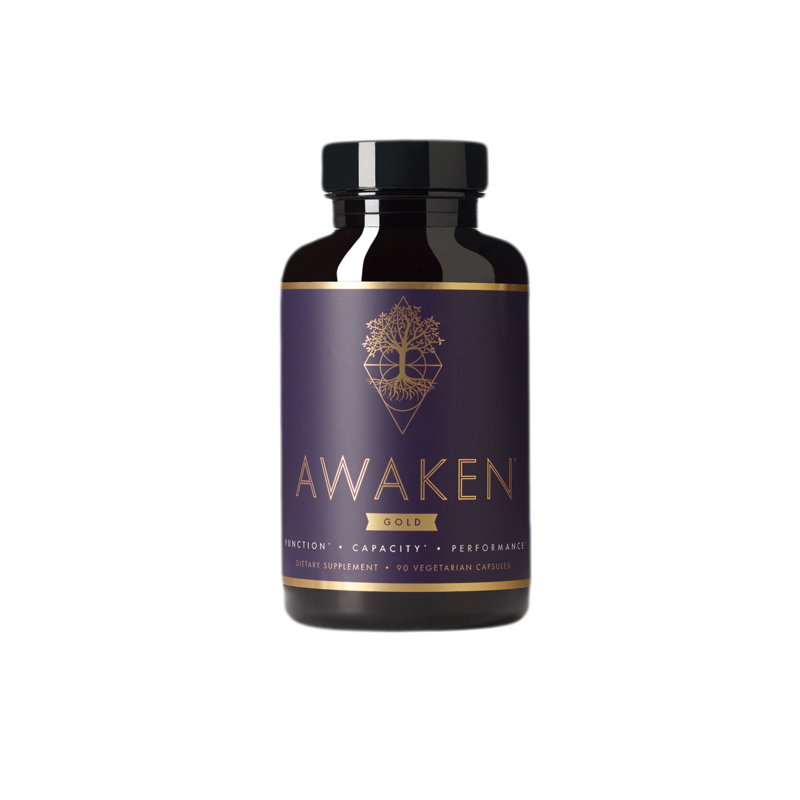 Awaken Gold’s “natural smart drug” status bridges the gap between mental nutrition and enhancement. Altogether, this eclectic stack seems to simultaneously nourish the brain’s natural functions while also synthetically enhancing them beyond their usual limitations. For the nootropic purist, this latter form of cognitive enhancement might be a no-go. However, if you’re open-minded (ha ha) enough, Awakened Alchemy delivers a cool cognitive experience that can’t be bought with a myGNC membership. Read my in-depth Awaken Gold review. When I first glanced at GNC’s nootropic options, my heart sort of sank. I genuinely wondered if a Best Nootropic Supplements at GNC post was even possible, given how crappy most of their brain health supplements are. Or I thought I’d have to bend the rules and include a bunch of PWO “hybrid” formulas that make special claims on delivering a vaguely described “neurosensory” experience (which when you think about it doesn’t really make much sense). Fortunately, there are perhaps just enough effective nootropic supplements on GNC’s shelves to warrant this guide review. However, to be perfectly frank, these are only the best nootropic supplements …at GNC. I also did a list on Amazon nootropic supplements, and I ran into the opposite problem there: there are way more good (and, yes, bad) nootropic stacks to choose from on the world’s largest online retailer. So, odds are if you’re unsatisfied with this batch of “best nootropic supplements”, then you may find what you’re looking for outside of GNC. Yet, again, if you’re a frequent GNC shopper who’s now considering dabbling into the fun world of nootropics, hopefully this list may be of service to you. Any tips on making the beyond raw powder palatable? I put it in some bulletproof coffee this morning and its still pretty rough to choke down.